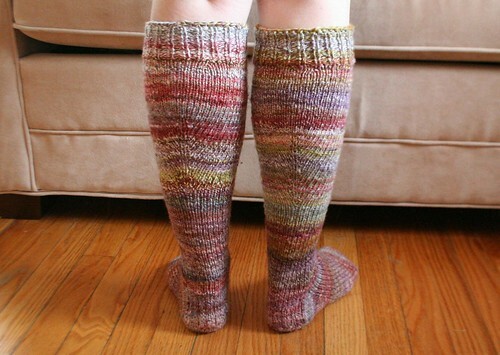 knitted :: handspun toe-up knee-high arch-shaped socks, originally uploaded by earthchick. Last month, I participated in a “Combo Spinalong” on Ravelry. 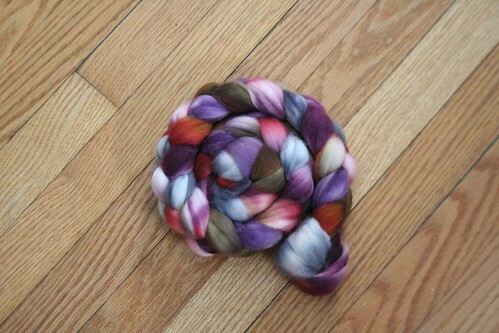 The idea was to combine different colorways into one yarn through plying. 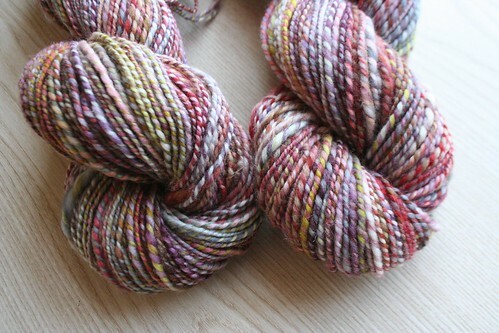 At least one of the fibers had to be either Hello Yarn, Spunky Eclectic, or Southern Cross Fibre. I’m a lucky girl, in that I have plenty of each of those fibers to choose from. But choosing is hard! 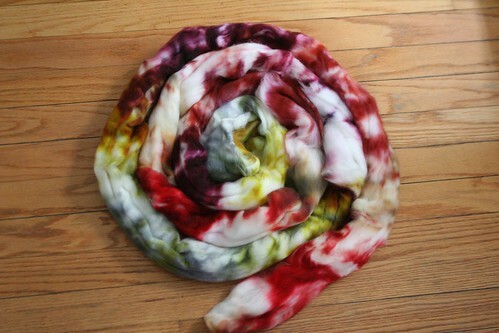 This was my first time combining fibers and I was daunted – I am always so impressed with the color genius of these indie dyers that I was hesitant to mess up with my own combinations. But I bit the bullet. 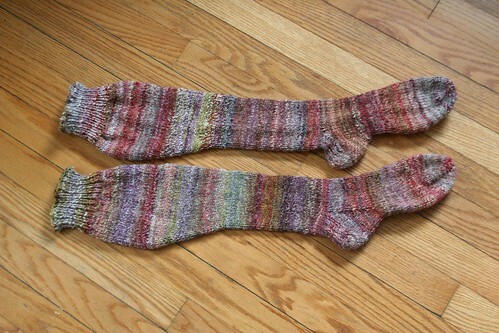 The result is the best-fitting pair of socks I’ve ever made. I can’t rave about David’s sock cookbook enough. It is infinitely customizable, and so easy to adjust because you can try on as you go. I threw in some arch shaping for my high narrow arches, and I am thrilled with how the arches came out. 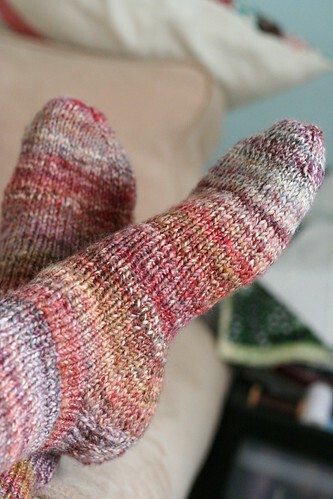 These are the first handknit socks I’ve made that don’t have excess fabric under the arch. 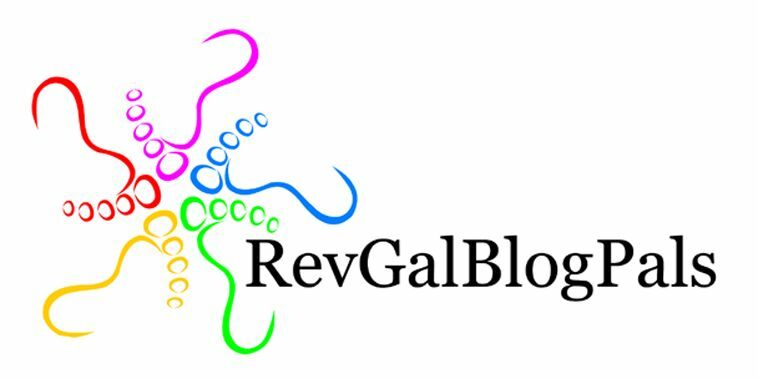 I’ve written up my full details about how I shaped the arches on my Ravelry project page here . After expanding out for the calves, I decreased a little before starting the ribbed cuff. I used the excellent stretchy bind-off David recommends in the cookbook. I’m pretty much in mad love with these, y’all. And it has stayed cold enough here (grumble grumble) that I’ve certainly had opportunity to wear them. I see more of these in my future. Lots more. I’ve got yarn to make some sock yarn too. Yearning to have time to spin it!! What awesome, happy socks! Love the colors and all the personalized shaping details. I just want to know how you plan to were them — with a denim skirt and short boots? I want to make a pair of these also, but I’m not a young girl, and therefore not 100% sure I can make it work. My legs are fine, and I like to dress a little bit on the funky side, but still….what do you think? I want to see a photo of you wearing these out in public! Then I will have the nerve to do it, too. Lovely! 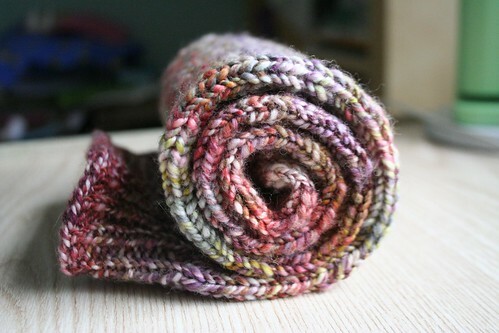 I think the colors turned out great – definitely different than I thought those two fibers would look together. holy crap these are SO awesome. and that fiber! amazing all around. They look great! I love the subtle stripes. Thanks for the tip on the book – I will look into that. It never occurred to me to do arch shaping. They just might be the loveliest socks I have ever seen, and I’ve seen lots of real beauties. Your yarn is so beautiful.